A nuclear weapon is commonly defined as a device, which uses a nuclear reaction for destructive means. The first nuclear weapon was successfully detonated on July, 16, 1945. The nuclear weapon, code named “ Trinity”, yielded an explosion equivalent to 20 kilotons of Trinitrotoluene (TNT), and an unexpected shock wave, that could have been felt 100 miles away. Before we can fully understand the chemical complexity and appreciate the engineering elegance of a nuclear weapon, we must first grasp basic nuclear chemistry concepts. Nuclear Fission- A nuclear reaction caused by nuclear decay of an unstable atom. As a result of the instability of the atom, the nucleus splits into 2 fission fragments also yielding free neutrons and exorbitant amounts of energy (both in the form of electromagnetic radiation and kinetic energy). Nuclear Fusion- Almost completely complimentary to fission. The nuclear reaction where two nuclei collide, at high velocity, and each of their respective nuclei squeeze together to form the nucleus of a different, heavier nucleus. Often times, the elements used in fusion processes today are the isotopes of hydrogen, deuterium and tritium. The reaction also yields free neutrons and exorbitant amounts of energy from binding energy. Nuclear Chain Reaction- As stated earlier in the text, a nuclear fission reaction yields free neutrons. In a nuclear chain reactions, the free neutrons from a nuclear fission reaction bombard near by fissile isotopes resulting in multiple fission reactions. These reactions result in colossal amounts of kinetic energy and gamma radiation. 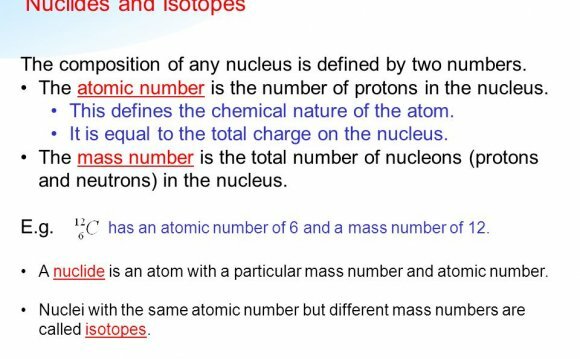 Critical Mass- The amount of fissile isotope required to successfully start and sustain a nuclear chain reaction. If the fissile material is at a subcritical mass it cannot sustain a nuclear chain reaction. On the other hand, if the fissile material is at supercritical mass, it will undergo a chain reaction at a faster rate. Nuclear Winter- A nuclear winter is a theorized outcome of a nuclear war. It is when enough nuclear detonations have taken place to scorch enough of the earth to release sufficient soot and ash into the earth's stratosphere to significantly diminsh sunlight and create excessively cool weather for up to years afterwards. Researchers estimate that the detonation of 100 Hiroshima type explosions in the subtropics would eject enough soot into the atmosphere to create a global climate change and a nuclear winter for most of Eurasia and North America for up to ten years, which would have catastrophic effects. Althought the effects of a nuclear winter would have other vast consequences, like depletion of the Ozone layer, the immediate consequences previously discussed are what are characteristic of a nuclear winter. Fallout Condition- Fallout refers to the radioactive material that "falls out" of the atmosphere after a nuclear explosion. It consists of dust and radioactive particles that can contaminate an area with radioactivity and pose a huge health hazard to biological organisms. It can contaminate the animal food chain which can have drastic effects on the affected region. Weather has a huge impact on fallout, wind currents can spread radioactive fallout either over a large area, such as in the case of Castle Bravo, or not. Gun assembly- An uranium-235 bullet is fired through a barrel at a fissile Uranium-235 target. The collision of the two isotopes causes the uranium samples to squash together to form a critical mass, at which time the mass initiates a chain reaction. The gun design can only work with the uranium-235 isotope. Implosion- A critical mass of a fissile material (U-235 or Pu-239) is surrounded by highly explosive material. When detonated, the explosives, usually TNT, compress the fissile material causing it to assume a state of supercritical mass. The supercritical mass then instantaneously takes part in a fission chain reaction. The first nuclear fusion weapons (also known as thermonuclear weapons) were designed to initiate a fission-based chain reaction. The fusion reaction between the hydrogen isotopes used, 31tritium and 21deuterium, would result in the free neutrons necessary to bombard a fissile isotope and start a nuclear chain reaction. The first thermonuclear weapon was detonated during the early 1950’s. Similar to the nuclear implosion design, thermonuclear weapons use the heat and radiation from a fission reaction to make the fissile material assume a state of supercritical mass. The supercritical mass then instantaneously undergoes a fusion chain reaction yielding exponentially more energy then a fission chain reaction. Fission Bomb- In a fission bomb, neutrons given off from the radioactive decay of an element, usually uranium or plutonium, are used to cleave adjacent atomic nuclei in the respective radioactive isotope. The neutron does this through force, like a bullet being shot at a piece of limestone, when the neutron hits the atomic nuclei, the large radioactive nucleus is split into two smaller nucleus' of different elements, depending on which radioactive element was used as the fissile reactant. The reaction of splitting the atom gives off an immense amount of energy, that was originally used to hold the nucleus together, and extra neutrons. The fission reaction in an atomic bomb begins when a given amount of TNT is detonated around a radiocative isotope such as plutonium. The explosion from the TNT compresses the plutonium to a super dense mass. Evenually the plutonium sample reaches its critical mass and the neutrons that are given off by the decaying nucleus' of the plutonium atoms cannot escape without bumping into an adjacent plutonium atom. When this happens, the hit atom is split which, in turn, gives off more neutrons which do the same thing. This fission reaction is the process used in the atomic bombs used against Japan during World War II. What happens in nuclear fusion?